One month ago, during a freak out-of-the-blue April snow storm, I slipped and fell in the middle of downtown Toronto. I fell really, really hard. I didn’t hit my head, but I felt very much in shock. Of course my first thought was, “I really have to get to that meeting” and staggered my way up the street. It wasn’t until three days later, after colleagues kept saying, “Are you ok? You’re acting really weirdly” that I went to see doctor. I had a concussion. I was advised to have complete physical and cognitive rest. No screens, no reading, no crossword puzzles, no light, only light music. “Can I draw?” was the first question I asked. The answer was yes. WHY that activity is allowable and others are not, I don’t know. Personally I think drawing deeply engages your brain. I’ve been continuing to draw on the labels that I had started before (you know, the ones that my autistic daughter ripped up during an overload meltdown). I’ve been drawing anything and everything: the bottle of Advil, my coffee cup, cells, how to use chopsticks diagrams, sweet and sour chicken balls, neurons, bugs. I’m thinking about (and therefore drawing) brains–concussions, depression, autism, learning disabilities, giftedness, left and right sides. And while I am drawing I am ever aware of how happy I am while doing it. I don’t care about the final product or what will happen to these drawings. I am just making. After three hellish years of an intense job while taking care of a special needs little girl, this concussion has forced me to stop and slow down and value what really is worthwhile. 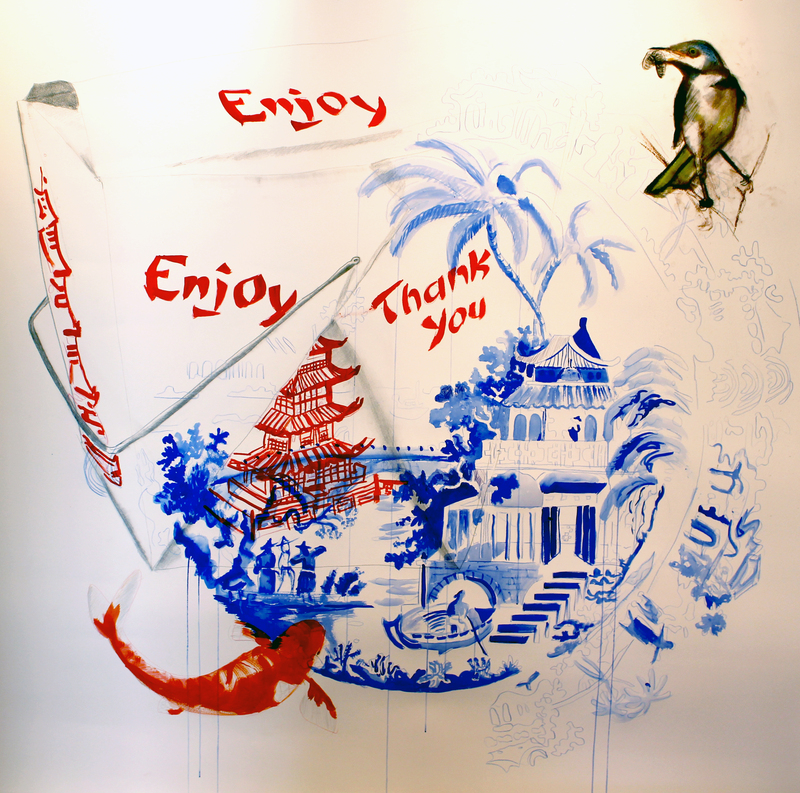 I’m starting a series of large drawings based on blue and white Chinoiserie style patterns, usually found on china plates. One particularly famous pattern is called “Blue Willow”. What’s interesting to me about these Chinoiserie blue and white patterns is that they were inspired by pottery that was imported into Europe in the 16th century. The scenes that are painted are fantastical and imagined Chinese scenarios. 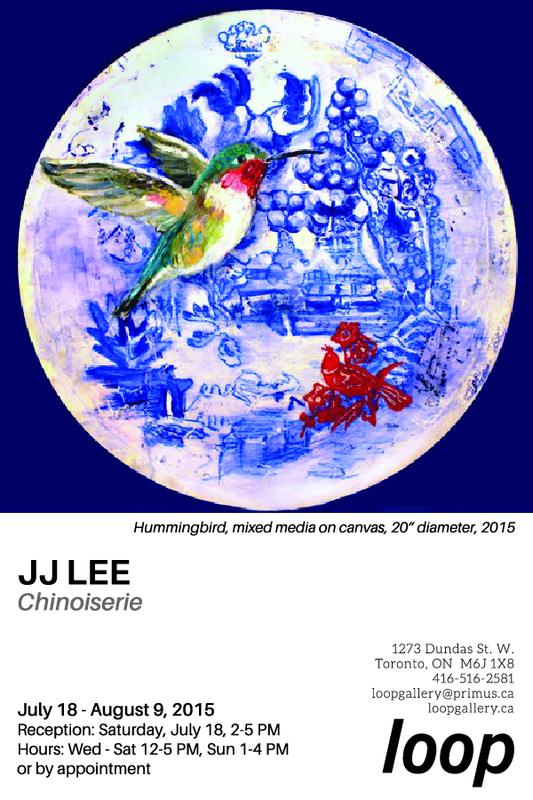 In this drawing here, I decided to juxtapose the blue and white Chinoiserie with a Chinese restaurant take-out container, a mockingbird and koi. I decided to mount the labels on a board, with T-pins, like specimens. My daughter, in a meltdown fury, had ripped up a few of these little drawings into tiny pieces. I of course was devastated but decided to use this act of destruction into a work of creation. The last two drawings pinned up are glued together, and the rest sit in a pile at the bottom. My time is extremely divided and limited. I try to steal moments to fit in making my artwork. 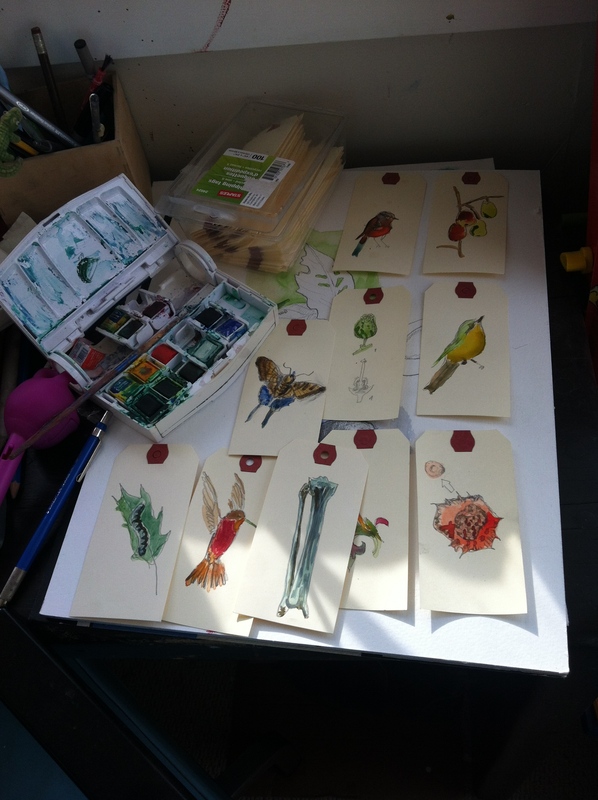 I started to make little drawings with watercolour on these paper labels. They only take a moment and I consider them mini-meditations. Recently, my beautiful, creative, intelligent daughter with hearing aids was diagnosed as being on the Autism Spectrum. Like the hearing loss diagnosis, it was a shock but it explained many things: her hypersensitivity to the way socks feel, her inability to transition from one thing to another, her unique way of speaking. Then I realized that we are all labelled and have many of them. I’m working on making hundreds of these little label drawings, of random things that catch my interest. On a recent weekend at a friend’s cottage, my seven year old wanted to paint on some of these labels too. I would love to see them integrated with the ones that I paint in a large installation–perhaps pinned on the wall, or hanging from threads, or in drawers and envelopes. These labels may be part of us but don’t necessarily define us.